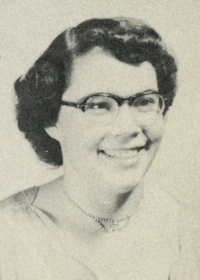 Obituary – Roads, Betty Ruth (McHenry) « Perry High School Alumni Association, Inc.
Betty Ruth Roads, 73, of Yukon, passed away Thursday, November 13, 2008, at Select Specialty Hospital in Oklahoma City. Funeral services will be held at 2:00 p.m., Tuesday, November 18, 2008, at the Yanda & Son Chapel, Yukon, with interment following at the Yukon Cemetery. She was born in Seminole, OK, on September 9, 1935, the daughter of the late C.W. & Margie McHenry. Betty is survived by daughter, Judy Weed and husband Walter of Yukon sons, Allen Roads of Oklahoma City and Wayne Roads and wife Gabriele of Cheyenne, WY grandson, David Weed of Yukon great grandchild, Payton Herstein of Cheyenne, WY brother, Jim McHenry and wife Dixie of Osborne, KS sister, Barbara Bercik and husband Bill of Anderson, IN, as well as numerous nieces and nephews. In addition to her parents, she is also preceded in death by daughter, Cheryl Roads and granddaughter, Amber Herstein.